Shagreen is the skin of rays or sharks. It is a smooth material with a pebbled texture. Using real shagreen became quite popular in the art deco era. It was a sign of luxury and opulence. Another reason I'm sure it was, and still is so popular is how durable the material is. While real shagreen is still being used in very high end pieces, most shagreen nowadays is a leather or vinyl faux shagreen. The faux is a near look alike in texture and durability. Another bonus of a faux shagreen is the colorways are endless. Shagreen is very popular in casegoods, accessories, and even wallpaper. So, who wants to go shopping? Because I'm obsessed, and especially with the chests and cabinets!! who doesn't love a round cocktail table? Would this not make a pretty special clutch? 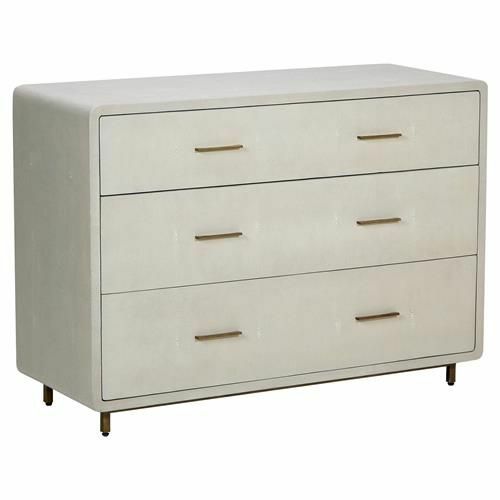 And my most favorite shagreen piece is this chest. I would happily take two of these for nightstands with a pretty spectacular canopy bed I have picked out if we ever settle down. Brad, I promise if I get this bed it won't have to come in through the second floor master bedroom window. But note the finish on the base and knobs. A good way to spot a quality piece is to check out the finish. Is it just spray painted or does it have depth in color and variations to it?